Splitting the final installment of a book-to-film franchise into two parts has always been a controversial move, and it’s probably never been more questionable than with the Mockingjay — Part 1. By offering the first act of the concluding tale as a stand-alone film, Lionsgate and company have made us wait a year for a plodding, dull, and thinly plotted movie that does little to move things forward. 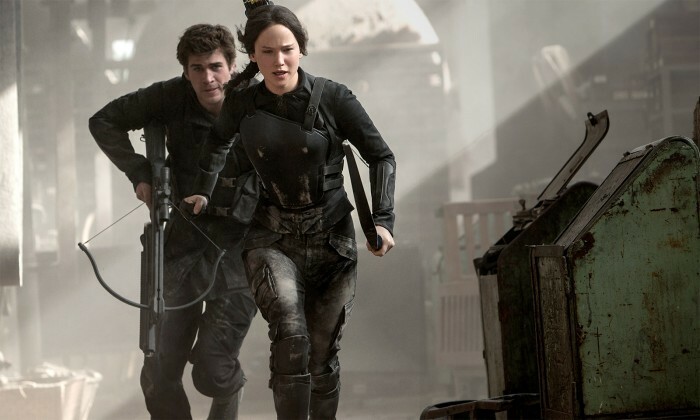 The movie picks up shortly after the climax of Catching Fire; Katniss Everdeen (Jennifer Lawrence)and some of her friends and family have been spirited away to District 13, where The capitol’s game designer-turned-freedom fighter Plutarch Heavensbee (the late Philip Seymour Hoffman) and President Alma Coin (Julianne Moore) are fanning the flames of revolution throughout Panem. To do so adequately, they need Katniss to serve as the photogenic face of the movement, a camera-ready Joan of Arc if you will, in a series of propaganda films. Katniss, however, is more concerned with rescuing her true love, Peeta Mellark (Josh Hutcherson), who for reasons not to be revealed here denounces Katniss and the uprising in a series of interviews broadcast from the Capitol. The leadership of District 13 tries to get Katniss’ head in the game (and score some sweet broadcast footage) by sending Katniss into the field to observe the Capitol’s atrocities firsthand. And that really is the gist of it all. Katniss mopes, frets, sings, speechifies, and pines away while the adults try to manipulate her to their own ends to insure that the revolution will indeed be televised, after it is scripted by committee and sent through a focus group. Mockingjay‘s surreal take on propaganda and media manipulation does strike a nerve and could have made for a compelling theme if it had been played up more; unfortunately, this whiff of political satire that is little more than a device to move an anemic plot along, one that draws far too much attention away from the now-iconic heroine that has always been the franchise’s saving grace. Add to that the fact that Katniss is uncharacteristically passive throughout the movie, sitting in the back bleachers while the plot unfolds around her and at her, and often seems as disinterested as we are. The action set-pieces, surprisingly downplayed and lacking in energy, aren’t enough to perk things up, either. It’s a shame, given that up to this point Katniss has been an independent and proactive young woman. Where’s the fiery, defiant teen that became a role model to so many young girls? There are some saving graces: Hoffman fleshes out Plutarch considerably, making his recent passing even more heartbreaking. (The film is dedicated to him.) Woody Harrelson brings some much-needed humor as Katniss’ now-painfully sober mentor, Haymitch, as does Elizabeth Banks as her unflappable stylist, Effie Trinket. Mockingjay would have been better served as a single two- or three-hour finale, rather than a two-parter that is so far lacking in epic sweep. The movie runs in place for nearly two hours before limping to a half-hearted conclusion, and when the credits roll it’s hard not to feel more than a little cheated.